With pricing unchanged from the current model, the 2016 Acura RLX Sport Hybrid SH-AWD will be available at Acura dealers nationwide beginning June 3 boasting new features including AcuraWatch™, now offered as standard equipment on all models, and an available 360-degree Surround View Camera system. 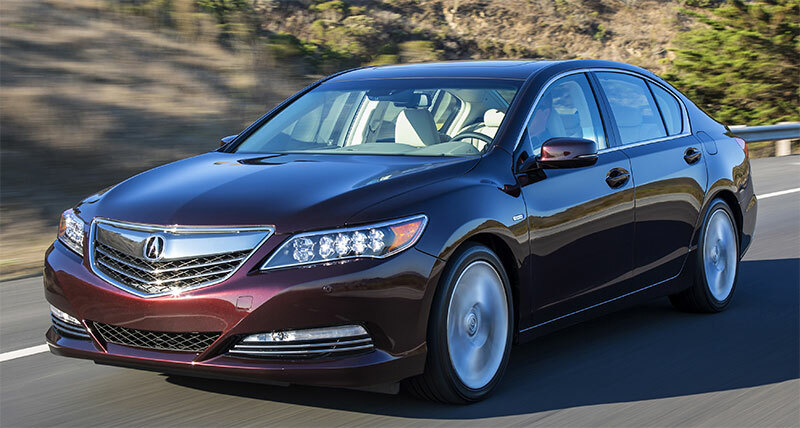 The only luxury sedan with a three-motor, torque-vectoring hybrid powertrain, the 2016 Acura RLX Sport Hybrid will carry a Manufacturer’s Suggested Retail Price (MSRP) of $59,950 with Technology Package and $65,950 with Advance Package. Producing a combined 377 horsepower and 341 lb-ft of torque2, the RLX Sport Hybrid is powered by a direct injected 3.5-liter V6 engine and three-motor hybrid system with Acura’s signature Super Handling All-Wheel Drive (SH-AWD) system. This highly effective powertrain provides a unique combination of exhilarating all-weather, any-road dynamic performance, and exceptional acceleration, while also receiving an impressive 32 mpg EPA highway fuel economy rating3. These performance attributes are matched by the RLX Sport Hybrid’s luxurious appointments and for 2016 even more comprehensive feature content including the AcuraWatch™suite of safety and driver assistive technologies and available Surround View Camera4, bi-directional starter and heated steering wheel. The 2016 Acura RLX is available in two trims, RLX Sport Hybrid SH-AWD with Technology Package and RLX Sport Hybrid SH-AWD with Advance Package. The RLX with Technology Package has been enhanced with AcuraWatch™ as standard. The RLX with Advance Package has been additionally improved with Surround View Camera4, bi-directional keyless remote engine starter and heated steering wheel. At the heart of AcuraWatch™ is the fusion of camera and radar technology that can sense the roadway and objects within it, including other vehicles and pedestrians. This technology underpins the systems that help provide the driver with improved vision around the vehicle, can alert the driver of potential issues and, if necessary, intervene to help keep the RLX Sport Hybrid from departing a lane, departing the road, or help to avoid or mitigate the severity of a collision. These systems include Road Departure Mitigation (RDM) and Cross Traffic Monitor, both of which are new to the RLX Sport Hybrid. New for the 2016 Acura RLX Sport Hybrid, Road Departure Mitigation (RDM) uses a Monocular Camera (mounted on the upper portion of the windshield) to identify solid or dashed painted lane lines, Botts’ Dots and Cat Eye markers. RDM uses both steering force, via EPS, and braking force, via VSA, to help the RLX Sport Hybrid from leaving a detected lane or detected roadway. The monocular camera can recognize lane features and identify a lane or roadway edge. If the RDM system determines that the RLX Sport Hybrid is about to leave a detected lane or roadway defined by solid lines without a turn signal in use, it will provide steering assist (primary) and, in rare occasions when steering is not sufficient, braking assist to help the driver stay on the road. If a lane only identified by dashed lines, Bott’s Dots or Cat Eye markers and the system determines that there is an unintended departure, no braking assist will be provided. Instead, the RLX Sport Hybrid will use active steering force to help return to the detected lane. RDM is integrated with the Vehicle Stability Assist (VSA) system to provide moderate braking, and with the Electric Power Steering (EPS) system to provide steering input. Multiple visual and audible warnings alert the driver when the RDM system is taking corrective action. These include a lane departure warning on the driver’s Multi Information Display (MID) along with an audible warning. RDM also has a customizable initial warning of either a steering wheel shake/vibration and/or an audible alert. This can be customized in the vehicle settings. 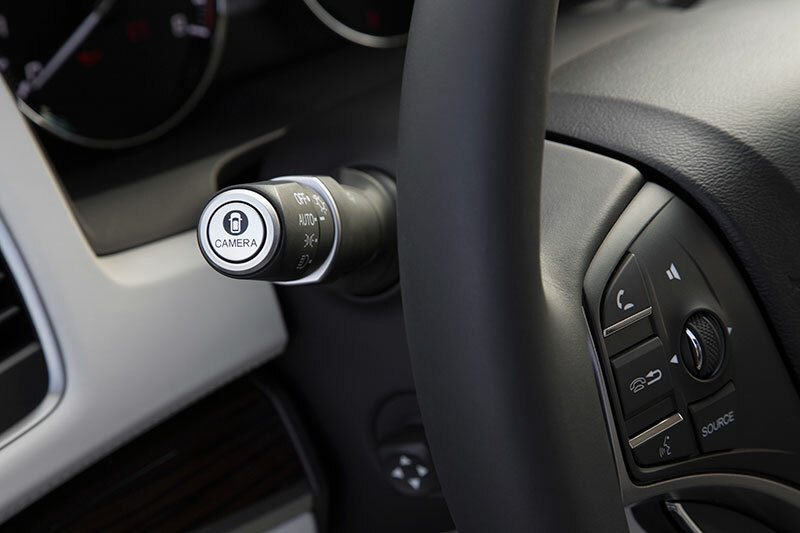 Another new driver assistive technology included with AcuraWatch™, the Cross Traffic Monitor works in conjunction with the RLX’s blind spot information (BSI) radar sensors to enhance driver confidence when backing up. The system is especially useful when reversing in congested parking lots with an obstructed view from the driver’s seat. The system utilizes a pair of radar units located in the rear quarter panels. When Reverse is selected and an approaching vehicle is detected, arrows indicating the approaching vehicle’s direction are shown on the center display’s rear camera image. An audible warning is simultaneously emitted. 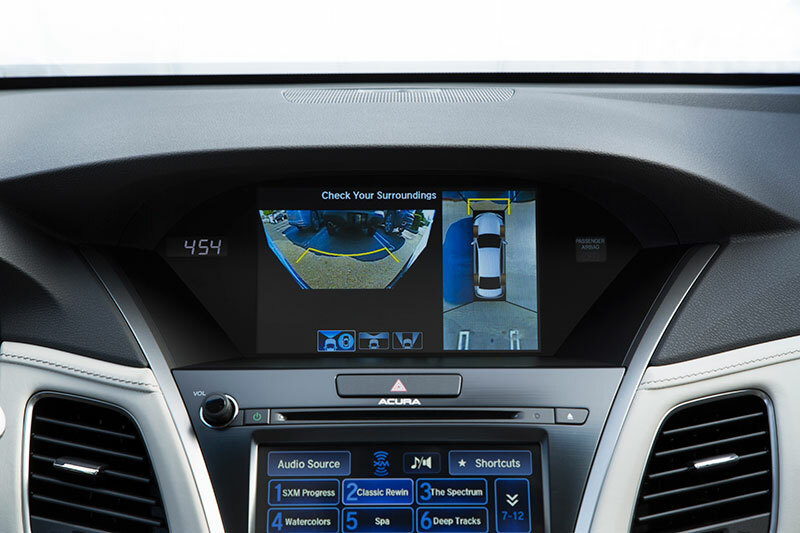 For 2016, the Acura RLX Sport Hybrid with Advance Package includes Acura’s Surround View Camera system6 that provides a 360-degree image of the area around the vehicle. The surround view camera system is designed to assist drivers during critical and precise maneuvers in snug parking situations. Using four separate cameras, views from behind, directly in front of, and both left and right sides of the vehicle can be displayed on the navigation screen. The system can also use all four cameras to seamlessly create a composite bird’s eye image, to provide the driver with information about the surroundings. In addition, dynamic on-screen guidelines help the driver see their projected path relative to the lines demarking parking spaces or other objects, allowing them to maneuver with greater confidence.